Crane Family Vineyards is owned by Peter and his son Tom Chiarella, not to be confused with Michael Chiarello the chef who has his own Napa wine and coincidentally whose family also comes from the same small region of Southern Italy as Peter’s family. Peter’s dream of owning a vineyard in Napa was born from a very interesting source. While commuting to work in New York City he read a feature in the Wall Street Journal about a select few top businessmen who had other avocations aside from their primary businesses. Reading about each of these individuals Peter saw that these were actually all business failures save for one. He read about a successful individual who owned vineyards in Napa as a second business and was successfully selling his fruit to other vintners and making a profit. This was a business that highly appealed to Peter. 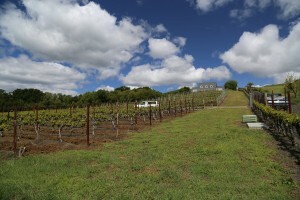 Unlike many who come to the Napa Valley in retirement with no plans to become either growers or vintners but then get sucked in by the “Napa Allure”, Peter came to Napa during his career – because of his company’s decision to locate their offices from Santa Monica. He worked for the Doctors Company, the largest physician owned medical malpractice insurer in the country. At one point the relocation team identified 17 different communities and on Peter’s strong recommendation, finally settled on Napa for its agricultural feel and dedication to preserving some of the surrounding land…and of course, no big freeways! Once he moved here permanently he started looking for a home and existing vineyards on the same property. Not finding this he started from scratch with land that previously was only used for grazing and never planted to grapes. Seeking out the advice of a top vineyard manager and soils expert he was given suggestions for possible varietals and in addition he had neighbors who owned several existing vineyards. After finding out this region of Napa is prime for both Merlot and Cabernet Sauvignon, he planted these varietals along with just a small amount of Cabernet Franc. Crane Family Vineyards owns 7 acres in the shadow of Mt. Veeder on the west side of Napa Valley on the southern spine of the Mayacamas mountains. The vineyard is located merely 3 miles from downtown Napa right on the edge of the city limits. It is named Don Raffaele which in Italian translates to “Sir Ralph” in honor of Peter’s father who was knighted by Italy after World War I. Not to be overshadowed, Crane is Fran’s maiden name and since the vineyard was already named after Peter’s side of the family it only made sense to name the wine in her honor! Once his vineyards came into production he started selling the fruit to several high end wineries. Fortuitously he met Jack Cakebread of Cakebread Cellars through a mutual friend and Jack convinced him to join his board of directors – as Peter says, his “retirement” became one year, then two and finally resulted in his becoming the President of Cakebread Cellars for 5 years. During his time there, he started thinking about making his own wine and a statement from Jack Cakebread set him in motion. Jack said “if you really want to know wine you have to make it yourself”. Peter then held back some of his own grapes and built a very cute small bonded winery just above his vineyard which he now refers to as “the house that Jack built”. This is certainly one of the smaller stand alone bonded wineries in Napa! Surrounded by the caliber of Cakebread’s winemaking team and other area vintners Peter had plenty of initial help as a first time winemaker. Wining top honors in almost every competition they placed wine in as well as a double gold medal in the 1998 California State fair (only 13 double golds out of 2700 entries) – indicated that they were onto something good. The first commercial release was the next year. Peter is both understated yet passionate and committed when it comes to his wine. He and his son in law were the winemakers for the first few years before eventually hiring Allison Doran who continues to make the wines today. She trained with famed vintner and soils expert Andre Tchelistcheff. As of press time they focus on several different wines all of which are from their property with the exception of the Zinfandel dessert wine which is sourced from a specific vineyard near Calistoga in the northern part of the Napa Valley. They produce four wines; a Cabernet Sauvignon, Merlot, a Cuvee named in tribute to Allison and their Zinfandel dessert wine. The 2005 Estate Merlot has very rich large aromas (for a Merlot) – a nice spiciness with cassis represented on the bouquet with more terroir driven mineralities as it opens up. There is a row of Bay trees growing near one part of the vineyard which may in fact contribute some of this spiciness to both the nose and palate. There are pleasant dark cherry notes on the palate with slight touches of mocha on the finish. The 2005 Napa Valley Cabernet Sauvignon has aromas of smoky tobacco with just a touch of vanilla – followed by a well balanced palate that includes flavors of black cherry, raspberry and nuances of plum. This is very smooth wine with delicate tannins and a super long finish. The 2005 Allison’s Cuvee Reserve Merlot also is blended with smaller amounts of Cabernet Sauvignon and Petite Sirah. This is an elegant Merlot that is very dark crimson in color. It is a wine that is well structured yet at the same time has the balance to be consumed now. Spicy pepper, tobacco and cherry aromas lead to a mouth feel that is very smooth and silky. This is their premium wine. The one wine (typically only a barrel) that is made in Peter’s own small winery on site is the Zinfandel dessert wine. The first vintage of this was produced in 2005 in honor of his grandson’s birth; it was going to be just a one time production to be saved for his grandson’s 21st birthday, but this wine came out so well, they’ve decided to incorporate it into their annual wine production. It is called Douceur or “sweetness” in French. Yes it is sweet and very rich, delectably so. The bouquet opens up with boysenberry jam aromas with a palate that explodes into chocolate, cherry and additional berry flavors. It has a velvety mouth feel with lots of layered fruit flavors. If you enjoy dessert wines this is a unique opportunity to acquire a small production entirely hand crafted wine.